with no internet connexion at home and no telephone I stay late at my new Platform office until late. For someone addicted to the wifi it is a big deal to be wireless. So, what news? You might ask. I had lunch with my new Platform’s artistic director who seemed to like my project. He has been very diplomatic considering funding, and to be honest I don’t know what that means. Will he move his little finger? I am a bit exotic to him but I trust in some form of Providence that is present whenever I follow my instinct. Whenever I do things I don’t usually do. So have a clementine (for vitamin C) and a piece of chocolate (for the pleasure) April and let the universe take charge! Let your imagination run wild! Go celebrate Halloween and have fun! No, October dear, I don’t mean completely. I mean at home. I haven’t a bank account yet and the telephone company mailed my bill to the wrong address. I also forgot my oyster card at home. Is there a special message in all this? Oh probably I need to play lotto. Because my bill was sent instead to a lotto game center. Now, I ended up finding a place to connect myself to the internet and write down my thoughts and feelings. Tomorrow I meet the boss of the new platform I have landed to in London and I am eager to see what he feels. Here I am, April, motivated, crazy and always with many dreams I need to put into action. With book plans, projects and ideas to last two life times. Maybe I need to choose one or two and communicate them as clearly as possible! How was your day October? partly sunny partly cloudy? Well for London it couldn’t get better!Do you know how that made us humans feel? As an unexpected and surprising gift. This is how I feel when someone I don’t know very well, manifests a form of kindness to me. In a way I can’t explain. It takes me by surprise, and can move me to tears. Almost as having a sunny autumn day in London. Having a friend, or a lover, a parent, a colleague, being nice to us, is something which we could more or less expect. After all, this seems to be the definition of their role. Or people who depend on us. Or with whom we went to school together. Or who were born in the same small town. But strangers? So a new friend, someone who shows generosity to me when I need it, and when I least expect it, just makes me feel that love, beauty and truth are as real as trees and cars. October 23, 2015- Flatmate found! just thank you for puting a word for me! Yes, Yes, Yes I found a flatmate!What do I know about this person? Almost nothing. My future flatmate is a French woman working for a private company. When she visited, she seemed practical and efficient. Capable to share the rent and eager to move in right away. Is this the first time I live with almost total strangers? No. The very first time was when I went camping, and I was 8 year’s old. The very next, when I moved from my small town to Paris, to study. I stayed at a student’s residence and I was sharing a room. It was the only thing I could get and afford before the term begun. It worked out ok. I later moved to my own room, but there was still the shower and kitchen to share with other four people. We ended up as friends, or something different: the kind of relationship you have with school mates. Or for men who go to the army with their fellow soldiers. I guess :-). In any case, finding a flatmate is a huge relief and I look forward to my new life in London, which starts to become quiet organized. am I the only person who doesn’t know how to use a gas stove? And is this a reason to laugh at me? Of course gas stoves exist in France. But I had never been faced to one. a. how do I open the window? c. how do I use the washing machine? d. is this the way you turn on the shower? Anyway, it is not a question of a cultural change, no. Here, I simply admit that I am not very handy with machines and objects. I spend twice as much time to do the simplest thing. But still, this is fun. To come to London and spend some of my last economies in order to be create in a different artistic Platform. A place that seems dynamic and welcoming.Will I be up to their expectations? To rent a flat with two bedrooms without really affording it. Couldn’t I just start small, with a tiny room? Will I find soon the right flatmate? Somehow it was easier to persuade a real estate agent than a group of people for a flatshare. So here I am. With my autumn cold. Sneezing. No, I didn’t go shopping, I already feel guilty of spending my economies on moving in and out, following my dreams, etc; so a “re-look-age” as we say in France, was not in the picture. But I wanted to take a look of the fashion in London. So I went in, out and about. I asked about prices. Let’s say that it was a market study. How different does it feel compared to Paris? Well, in terms of clothes, there are the brands you find everywhere, and then of course, even there, some details that make a difference. Did you know there are so many French in London! Everytime I go somewhere, I hear people talking French. I also went to Kensington, another area full of Frenchies. So that I don’t feel “depaysée“, homesick, so to speak. But I am amazed how close we are with Londoners, and how different. Everything here comes in bigger quantities. If you ask for a “gâteau au chocolat” in Paris downtown, you get something as big as your small finger. You want a bottle of water, the big one, is 1,5 liters. Now chocolate cake at Nero’s in London, is huge. And a café latte or a cappuccino are at least twice as big. Bottled water at M&S comes at least as a 2 liter bottle. When I went to a pub, the garçon didn’t come to take the order, I had to go to the counter. Why bother to travel if we find the same little world we have left behind? October 15, 2015: In London! I finally made it! I am so grateful for the help of my friends! Without them I would be still in Paris looking at the pile of my clothes and books and wondering how they would transport themselves… if only tele-transportation were possible! Yes, without friends I wouldnt’ t have moved in and out of Paris. Can you picture me at 7 in the morning running breathless at the Eurostar queue, with 2 huge suitcases and a small one plus a computer bag a hand bag and another smaller bag? It wasn’t very elegant, it wasn’t Parisian at all. And more the less, I forgot my handbag at the control. Yes. So I had to miss my train go back and recover it and take the next one. In any case it is only because five yes 5 people intervened after me that the miracle could take place! My best friend and neighbor who had the keys. Another friend who came to put on a box all the little stuff that was still here and there (from cosmetics to jewellery and a souvenirs …) Another friend who would come to gather a big box and store it in her place. The cleaning lady who would clean up what was left of the mess. And the muscle guy from the shop around the corner who brought down the heavy bags full of documents to throw away. Not to mention the other friends who have helped me the previous days to mail most of my clothes to my parent’s home in the South of France. Without these friends, where would I be now? Probably in the same spot. But thanks to them I am in London in my new position. In Central London. I also got a sore throte but I am happy. you know I am moving out of my place in Paris? Why don’t you give me a hand? Haven’t you seen there is absolutely nothing packed yet? As to moving in… I still need confirmation from the real estate agency in London. That they received the first rent. Well, one of my candidate flatmates was kind enough to invite me to his place if I don’t have any. No he doesn’t know me yet. It could be that my Facebook photos are to my advantage. Or that this is a genuinely kind person. It is possible. I shed a tear of emotion yesterday. Now, how about boxes? The boxes I am to put the staff that needs to move out? Not to be found this afternoon. The shops around the corner had already disposed them. Yes, I should have asked before. Ok, Ok. I did go to the hairdresser to have a hair cut. But this is necessary to keep me cool. Is it better to arrive in London breathless and with impossible hair? It is as if I knew them. One of them, who is French, told me he has a girlfriend who is very “expressive” in their private moments as a couple, and asked me the distance between the flat’s bedrooms. So that the noise will not bother the other tenants. I just don’t understand why not look for a studio in that case. Another one is a beautiful young woman who seems very active, travelling around the world. Would I feel insecure if I bring a boyfriend in the house? A third is a Polish who is told me he is looking for something worth while for his money. A notion difficult to decide. A third is a woman in her 40s who is very much into cleanness. A baby sitter. A specialist in information technology. Someone else asked me how am I ready to share a flat with an unknown person. Well, I will trust my intuition. After all, in some parts of the world people get even married without having met each other. Sometimes, they are happier than those who knew each other long ago. Best friends go on holidays together and they end up fighting. The thing is, I am still in Paris, so I can’t meet them before the end of the week. So, strangers could be great. I am into trying something new. Please October, help me with a tip! I am in the middle of a relocation from Paris to London, and this is going to be the last week of my everyday Parisian lifestyle. This Saturday it was “nuit blanche“, with artistic installations and exhibitions both indoors and outdoors. Our environment and its future was the big underlying question. What a fantastic idea! 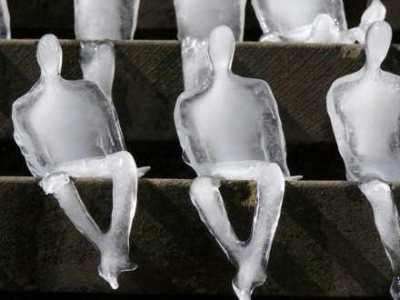 Néle Azevedo for example encouraged participants to create a frozen character they could place on the stairs and wait until the sun dissolves this figure in the morning. I like this idea as a metaphor : it is the best method to dissolve haters! I fell into one or two every now and then. The last two, people who judged my work for a competition I tried to win in March. I only got a chance to read their report today. It just couldn’t be worse! To resume their saying, there was nothing original in my proposal, the quality was bad, my work shouldn’t be considered and I was a fraud in every possible way. Had I only them to count on, I would have thought I was good for nothing in my field. Well, the thing is this type of haters influence some other people who decide on my artistic funding in France. What should I do? Impossible to fight back. They position themselves as experts. Maybe that particular position, as an artistic consultant was not for me. Or maybe it is. But another time at another temporality. So how do you dissolve this influence dear October? Focusing on something else could also help.